International Relocations: Should pricey private schools be a “given”? When thinking about relocating to a new country, a candidate’s first thought will likely be to evaluate the possible impact on his or her family. But is it always necessary to assume the children are to go to private or independently run schools? If education assistance is provided, the impact on program costs can be significant, particularly if the benefit is assumed to be “a given”. Education assistance is most likely to be included in policies addressing long term temporary assignments (68%) where, typically, the transferee is accompanied by his or her family. 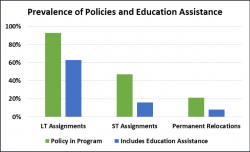 In the case of short term assignment policies, only 35% provide assistance, reflecting the fact that these assignments are mostly unaccompanied. Fewer companies have international policies for permanent relocations and, of these, 39% offer assistance. Given the permanent nature of the move, most organisations feel that the family is making an informed decision to integrate into a new environment and there is no justification to compensate for an inconsistency in education such as it can occur for a temporary assignment. International relocations are often more stressful on families than domestic ones because the changes and loss of familiarity are more dramatic. Education assistance can help with some of the difficult decisions surrounding the children’s education but companies should understand the implications of covering these costs. Too often, entitlement creeps in and the employers can find themselves involved in an emotionally charged situation with unnecessarily high costs. If administered as intended, the candidate understands that the offer of education assistance is determined after an assessment of what the destination has to offer and whether it is a reasonable solution. Organisations must decide whether they should be responsible for anything beyond what is deemed “reasonable”. Perhaps, in some cases, it is enough to offer counselling services to help the family better understand the educational landscape of the destination country and to identify suitable schools with the knowledge that they are responsible for costs above what has been communicated as reasonable. Children’s education is undoubtedly a sensitive subject, so with more rigorous management of the assistance offered, there is always the risk that disagreement will result in the employee refusing to relocate. The company then has to weigh the cost/benefit of that outcome versus its operational requirements. For those considering the addition of an education assistance benefit, or perhaps a review, it is important to carefully evaluate the types of relocations that will occur, the likely destinations, along with corporate objectives and competitive demands. Ward O’Farrell Consultants has gained significant experience in this area and has helped many companies assess and/or design successful international relocation policies.